No I’m not forecasting this and to be honest I really haven’t even looked at the forecast for next weekend besides noting that it looked cold and it could be stormy. Still, I’m amazed by the number of articles about what the NFL will do about a Super Bowl snowstorm in New York and the nonstop buzz in the weather world about it. If I had to guess the NFL has their mind already made up about what to do in the event of a blizzard. They’ll play the game in virtually any circumstance. The amount of money already on the table makes rescheduling the game virtually impossible. The game is played during the evening on a Sunday for a reason – it maximizes television ratings coast-to-coast. Delaying the game or moving up the game won’t work. Playing it on a Monday or Saturday? Nope – that’s not going to happen either. Losing 5% or 10% of your expected ratings will cost millions and millions of dollars. The NFL is brilliant. They know TV and they know how to make money. When scheduling the Super Bowl in New York City they knew that a blizzard was a possibility and I’m guessing they weren’t too concerned. Just as importantly, the drama surrounding a Super Bowl blizzard would be television gold. The frantic wall-to-wall weathercasts about the heavy snow (from the usual suspects), the second guessing on Twitter (from the weather community), and the images of swirling winds, blinding snow and freezing fans would make those indifferent about football even more interested in the game. So, here’s my forecast. Even if only half the fans who have tickets can get there the game will go on as scheduled come snow or sun. Yesterday I sat here in the weather office looking at the weather maps for Tuesday and thought, “that’s probably going to come west – at least on 1 or 2 model runs” and that’s exactly what has happened. These systems always seem to want to sneak a bit closer to the coast and this one definitely had that look. The actual low pressure that forms is forecast to be well off the coast – far southeast of Nantucket and the Cape but there’s a fairly large swath of precipitation that extends far northwest of the low center. Why is that? The GFS closes off an area of low pressure just east of Atlantic City about 5000 feet above the ocean and you can see a band of convergence up through southern New England. In fact, as the large scale trough sharpens there’s a fairly notable zone of frontogenesis that develops from 650mb-850mb across southern New England. Frontogenesis in the atmosphere forces a thermally direct circulation to develop in order to restore thermal wind balance. That circulation results in upward motion on the warm side of the temperature gradient – and that is what will force precipitation well west of the surface low. The question is just how far west that frontogenetical circulation will get. The GEFS members show several pretty far west as you can see plenty of precipitation progged in Connecticut. The ensemble mean off the 18z GFS brings >0.25″ of liquid as far west as New Haven, Bridgeport, Middletown, and Willimantic. Additionally, the atmosphere will be quite chilly in the low-mid troposphere. 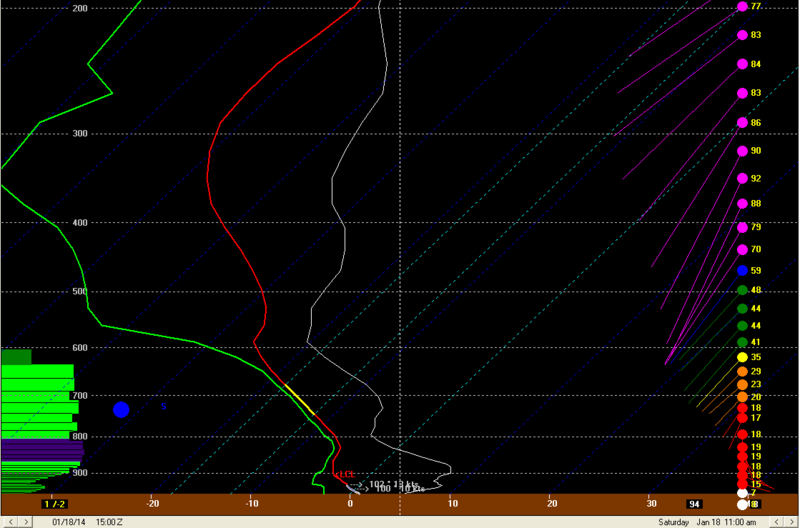 The 18z GFS shows good snow growth with a deep layer of high RH through the dendritic growth zone (-12c to -18c). The one downside to the GFS BUFKIT sounding below is that the best lift (omega) is above the DGZ here in HVN though it is better in GON where the best lift is a bit lower and deeper in the troposphere. So what’s going to happen? That’s what we all care about of course! At this point I’d say some accumulating snow is likely especially in southeastern Connecticut. The amount of snow is still up in the air and we won’t have a better idea until later tonight. 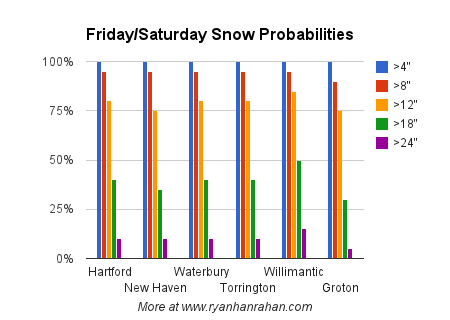 We should be able to throw out some numbers tomorrow morning but from a probabilistic sense here’s what I’m thinking. I have egg on my face. No doubt about it. 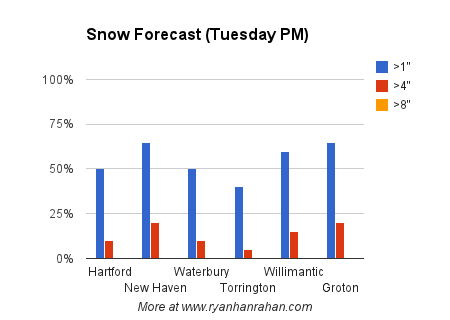 My forecast from Friday was a bust for parts of Connecticut. Here’s a look at what was predicted followed by what actually fell. Yikes. Busts happen. It’s the line of work we’re in. 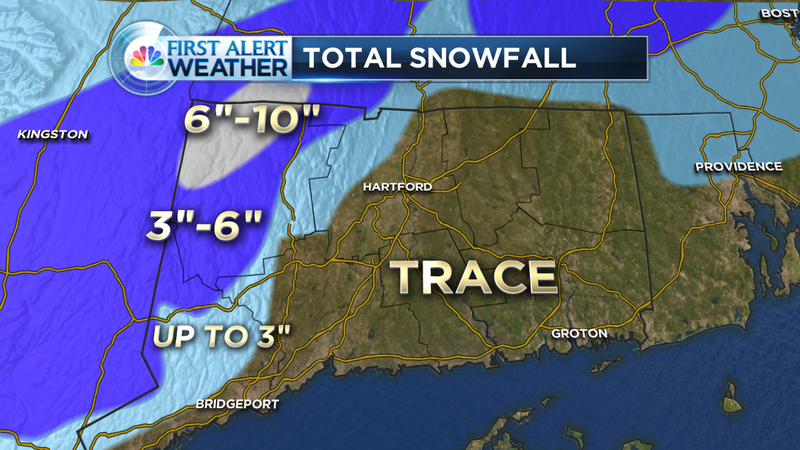 While most of Connecticut saw little accumulation (as expected) towns west of Route 8 and north of Torrington got pummeled by an isolated, but powerful, complex of snow. Forecasting something like this isn’t easy. It’s akin to forecasting the developing and path of a summertime thunderstorm. In the summer, storms can drop 1″ or 2″ of rain on one side of a town and nearly nothing on the other side of a town. That’s the nature of the beast in the summer. In the winter our storms are generally much larger in area and affect a wide swath. Saturday’s storm was different. There were signs of trouble, and an overperformer, yesterday. Here’s what I wrote on Twitter. As it turns out the interesting factor was high and by highly uncertain I meant really really really uncertain! So what was it about the storm that made it interesting and uncertain? The setup for this storm featured a long inverted trough extending northwest from an area of low pressure well offshore. Low level convergence was occurring along this trough with northwesterly winds behind to the south and easterly and northeasterly winds to the north. Meanwhile, modest quasi-geostrophic lift was occurring over southern New England with weak warm advection from the boundary layer to 850mb decreasing with height above that plus strong differential cyclonic vorticity advection ahead of a strong shortwave embedded in the long wave trough. While the synoptics are fairly straightforward it was the mesoscale aspects of this storm that produced wild snowfall gradients from 0″ to 10″ in a relatively short distance. One of the signals on the computer models that this storm could be a challenge was an impressive amount of instability over the state. Instability can form convection (or thunderstorms) and that’s indeed what happened. In fact, upright convection formed over New Jersey and New York City with thundersnow, thunder graupel, and even actual hail near the Jersey Shore. 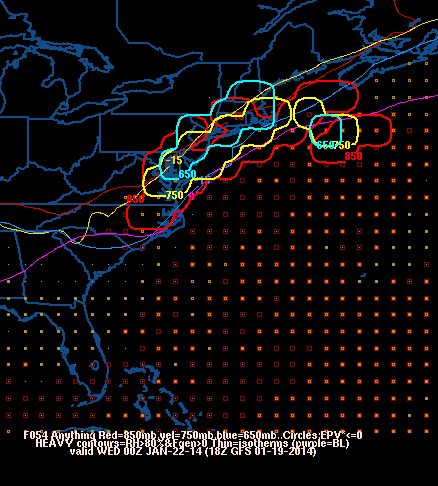 The 00z NAM computer model developed 100-200 j/kg of CAPE across Connecticut for this afternoon. That was a tip off something a little funky was going on. Additionally, models showed a spike of Total Totals (an instability index that is useful this time of year) into the mid 50s. The morning weather balloon launch from Brookhaven, NY showed a conditionally unstable layer and I think the smoking gun here is the 3-hour forecast sounding for Canaan, CT off the 12z NAM. Lapse rates are exceptionally steep from 800mb to 600mb – nearly 8C/km! 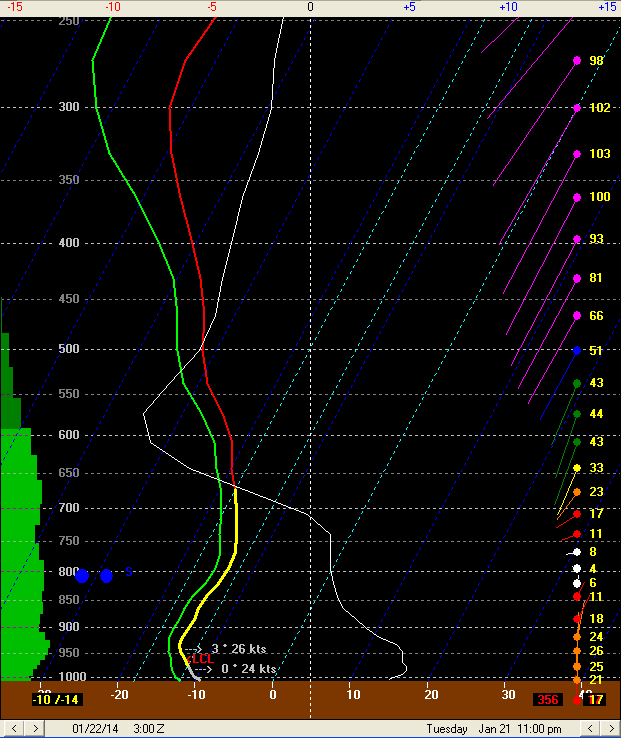 In addition the sounding is saturated at this layer and the layer intersects with the snow growth zone of -12c to -18c. Upright convection like you’d see in the summer was favored in Connecticut. Indeed, upright convection is what happened. The convection was able to develop a mesolow (notice the spin below on radar) which is pretty unusual but not unheard of. Enhanced forcing to the north and west of the mesolow (frontogenesis) likely produced the pocket of 6″-10″ of snow on Route 44 near the Massachusetts border within the larger swath of 3″-6″. While elevation played some role I don’t think it was the biggest culprit here – mesoscale banding was by far more critical in determining which areas got the most snow. At the end of the day this storm acted like a summertime thunderstorm (the process that produces summertime storms – convection – is exactly the same as what we had today). We don’t even attempt to pin down the exact location, track, and intensity of a specific thunderstorm 12 hours out in the summer – it’s something that no one has the skill today. We can mention the threat for a thunderstorm but they are, by nature, relatively hit or miss. In the winter, the impact can be large with a swath of heavy snow while in the summer a band of 1″-2″ of rain from a cluster of thunderstorms like this would have relatively little impact. Growing up as a weather-obsessed child I always regretted not being a little bit older so I could have been alive for the 1978 blizzard. Being a once-in-a-lifetime event it was certainly possible I would never be able to see a storm like it. Just days after the 35th anniversary of the 1978 blizzard Connecticut was clobbered by the worst blizzard since ’78. The easiest way to quantify a snowstorm is by the amount of snow that falls. There’s no question the Blizzard of 2013 dropped the most snow across a large portion of the state since 1888. Looking through Northeast Snowstorms from Kocin-Uccellini there was no storm since 1888 that came close! The state record 24 hour snowfall was likely broken in several towns – the National Weather Service is investigating this now. Here’s a look at the official snowfall measurements from the NWS cooperative observers. The first thing that jumps out at you is how few cooperative observers we have in 2013 reporting snowfall as compared to 1978. It’s a shame. The second thing is that there’s no question the snowfall in 2013 was more impressive than 1978. In fact, based on snowfall alone, the ’78 storm doesn’t seems to be much worse than other storms like January 2011, January 1996, Februrary 1983, etc., right? It was the wind that truly set 1978 apart from the pack. The 17″-24″ of snow in 1978 (and up to 30″ in far eastern Connecticut) was whipped by winds that gusted to near hurricane force. This is how John Bagioni who owns Fax Alert Weather Service recalls the 1978 blizzard. John is one of the best meteorologists in the state! The 78 storm had ferocious winds that were much strong than this storm. Widespread winds in the 50 to 70 mph range were common with some 80+ winds… At Wolcott High School (elevation 700+) where I was working and running a CT Weather Forecasting class, had a Maximum Gust Master anemometer with a battery back-up… A week later when we got back, peak wind gusts was 83 mph!!! I was just starting to consult with a few towns and DPW back in 78. The superintendent came over the weather office at 7 AM (Monday); we saw the amazing obs starting to show up to our southwest; the students got off the buses at about 7:15 and were put right back on by 7:30 to head home… We just shut it down right then and there… The winds caused extreme drifting in the 78 blizzard. Drifts to 5 to 10 feet were common with much higher drifts than 10 feet noted. At Wolcott High School a drift almost made it to roof level and had to be knocked down to keep students from climbing up it on getting on the roof days later once it had hardened!!! 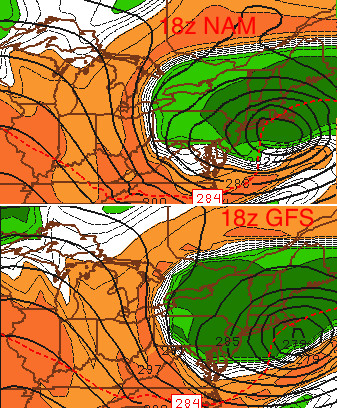 The 78 storm followed shortly after a terribly forecasting bust in late January. A big storm was expected and it was almost a total fail and the public was disgusted with the inaccuracy of the forecasting. When the blizzard was predicted (and it was well predicted, in fact the old Travelers Weather Service based in Hartford indicated Sunday in their forecast that where you were late Monday afternoon is where you would likely be for several days! The old LFM model nailed the storm), many did not believe the forecast, and did not follow the advice about getting to a safe location by early to mid afternoon. By mid/late afternoon travel was almost impossible and by late afternoon hundreds were stranded and it continued to spiral out of control; few folks had 4 wheel drive vehicles back then. Even though we had less snow, the combination of extreme wind, unbelievable drifting, the lack of public awareness made for a crippling storm… Travel band lasted days and work and/or schools were shutdown anywhere from 3 to 5 days. Many towns had to bring pay loaders in to open up streets; also I believe National Guard to a much greater degree than today was needed as well. I remember night after night of listening to pay loaders working on all the neighborhood streets (I was living in Bristol then). While very disruptive, in my experience, the 78 storm was more crippling and life-threatening, primarily due to the powerful surface winds. The surface observations show the strength of the wind during the height of the 1978 storm. In Bridgeport the winds were sustained at 41 m.p.h. with gusts to 55 m.p.h. at the storm’s peak at 5 p.m. In fact winds gusted above 50 m.p.h. occasionally between 4 p.m. and 3 a.m. the following morning. Bridgeport also had 6 straight hours of winds gusting >35 m.p.h. with visibility <1/4 mile (either 1/8SM or 1/16 SM) between 1 p.m. and 6 p.m. on February 6th. In Groton the 1978 blizzard produced a sustained wind of 46 m.p.h. with a gust to 69 m.p.h. at 3:06 p.m.! That’s a ferocious wind for a blizzard in Connecticut. The visibility at the time of that observation was 0.1 miles. In Hartford winds gusted to 52 m.p.h. (sustained at 34 m.p.h.) at 8:06 p.m. on February 6, 1978 with a visibility of 0.1 mile. Brainard had gusts >35 m.p.h. and <1/4 mile visibility for 4 straight hours. Comparing ’78 to ’13 is almost an apples to oranges type of comparison. 2013 had more snow and 1978 had more wind. ’78 occurred on a Monday and many people left for work not thinking the storm would be as bad as forecast. Everyone knew 2013 would be a monster and it peaked Friday night when most people were hunkered down at home. More people have 4 wheel drive now than they did 35 years ago. All of those things make the comparison tough. Snow is just one piece of the puzzle – societal impact is by far more important when judging where a storm will fall in an historical context. For example, do you remember the February 2006 snowstorm? I do but I’m sure many don’t. People certainly won’t be talking about it 20 years from now even though it dropped 20″-30″ of snow and is the largest snowstorm on record up at Windsor Locks. It was a lame storm, though. Winds were dead calm, it struck on a Sunday morning, and it was total fluff. You could shovel your car out in a few minutes without breaking a sweat. Within hours the snow was compacting and sublimating making it a rather pedestrian storm for a record breaker at BDL. 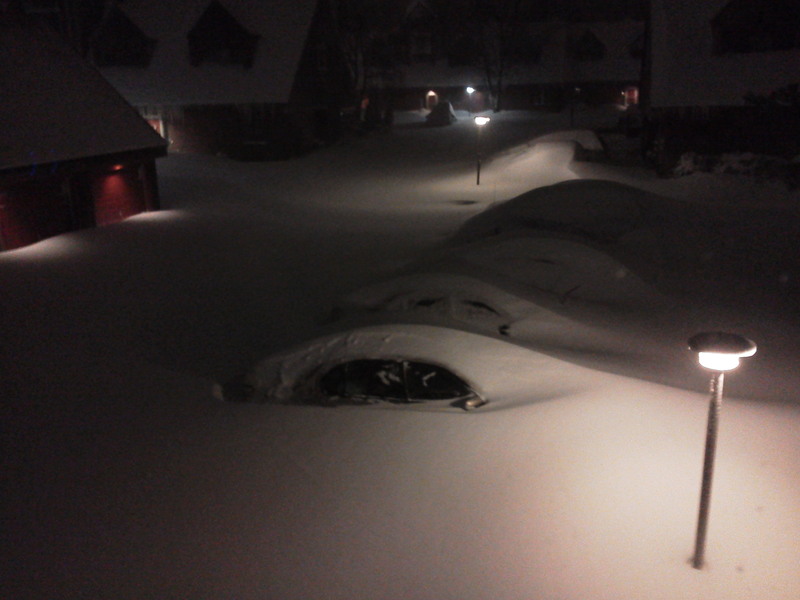 The Blizzard of 2013, on the other hand, contained an incredible amount of “liquid” for a storm that dropped 30″ of snow. This wasn’t fluff! 3.00″ to 4.00″ of liquid was common in the area hardest hit. A period of sleet/graupel also fell which made moving this stuff next to impossible. 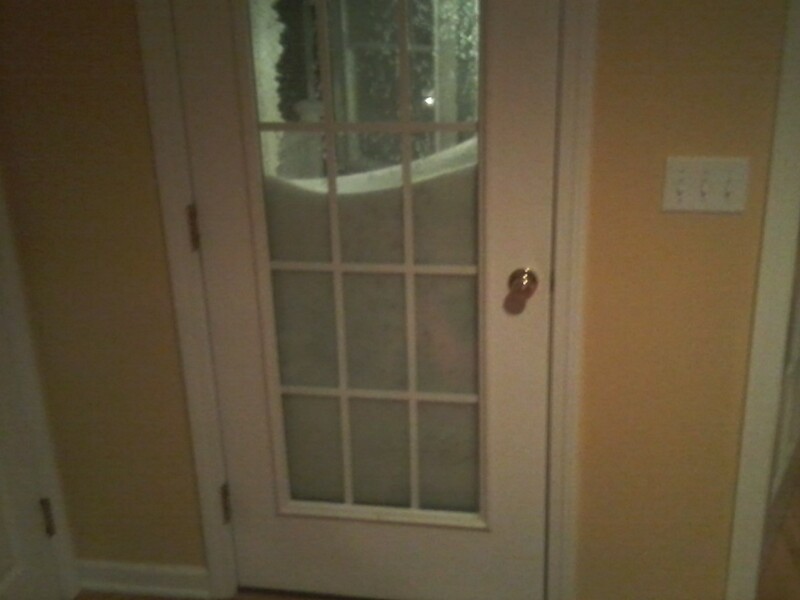 This snowstorm has undoubtedly joined the pantheon of historic Connecticut snowstorms that people will talk about for generations to come. The blizzard of 1888, the blizzard of ’78, the October Snowstorm of 2011, and The blizzard of 2013 are the top 4 (since the late 1800s) without a doubt in my mind. 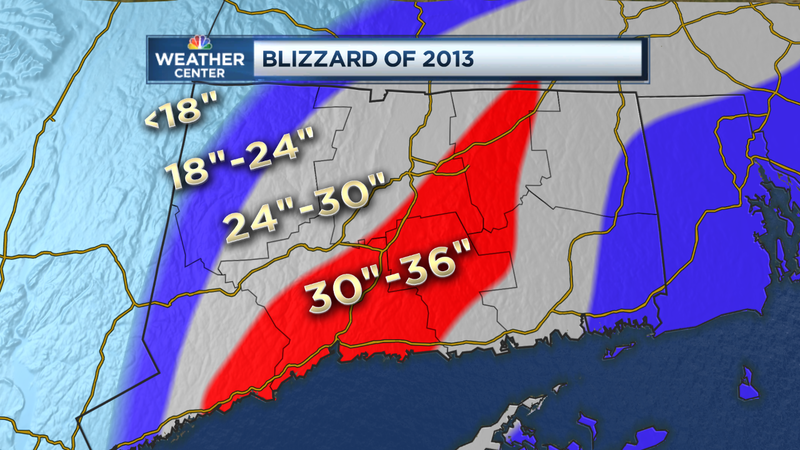 15″-25″ of snow with gusty winds will make the blizzard of 2013 one to remember. A beautiful phase between the Polar jet and sub tropical jet will result in a powerful nor’easter just off the coast. The storm will stall and do a loop-de-loop off of Cape Cod which is a characteristic of some of our most powerful and memorable storms. 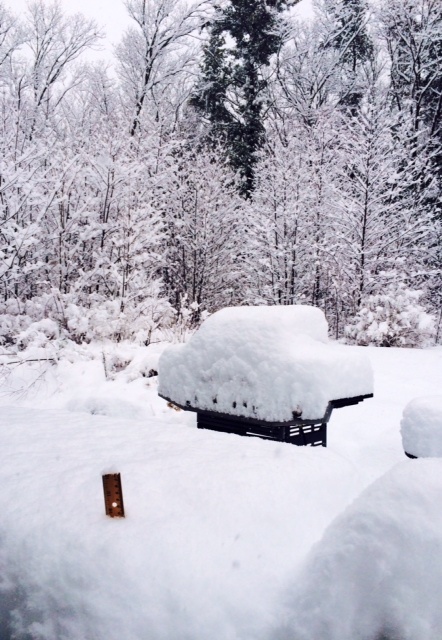 15″-25″ of snow statewide. It’s possible someone in southern New England gets 30″-36″ of snow but it’s too early to say where that will be. Wind gusts to 60 m.p.h. in southeastern Connecticut and 40-50 m.p.h. elsewhere will result in isolated to scattered power outages. Not a huge deal but some people will be in the dark. Blizzard conditions (wind gusts >35 m.p.h. and visibility <1/4 mile) will be possible in parts of the state. 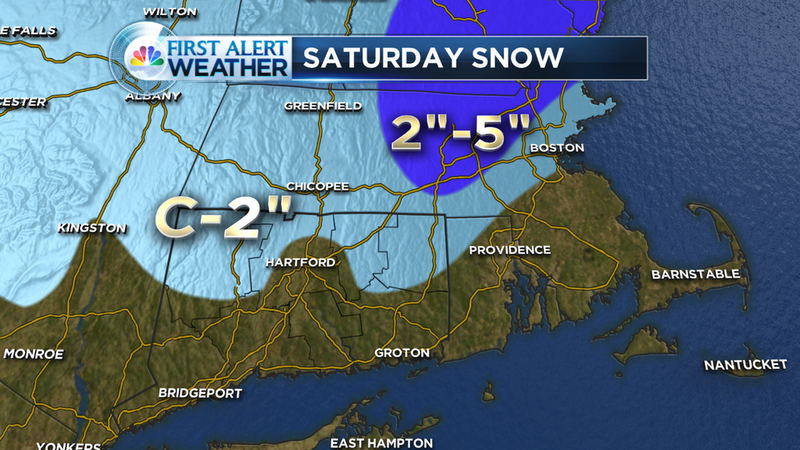 The storm begins as light snow after 8 a.m. A steadier and heavier snow overspreads the state after noon. The heaviest snow will be during the evening and overnight when snowfall rates may approach 3″ or 4″ an hour. Travel will be difficult so stay off the roads if you can. A period of mixing with sleet is possible in coastal Connecticut but it’s possible that this remains an all snow event in many areas including New Haven. 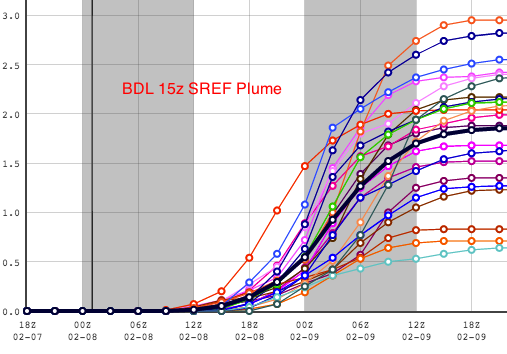 Here’s the 15z SREF plume for BDL which shows a mean QPF of about 2″. This matches well with the European model (though is a bit less) and is a bit higher than the GFS. Each line here represents an ensemble member’s forecast with the black line representing the mean. Whether the southern stream disturbance (which is firing impressive convection and being modulated by strong latent heat release and PV generation) will truck east a bit and stay farther offshore. How mesoscale banding (and associated subsidence) will modulate snowfall totals. To answer question one here’s a look at the 18z GFS and 18z NAM 700mb height and RH forecast for 00z Saturday. Notice the NAM (which actually agrees with the Euro) is much closer to the coast with the center of the 700mb low than the GFS. The GFS – off the coast of Nantucket – is too far east for monster snow totals here in Connecticut. The second point, about mesoscale snow bands, is just about impossible to pin down ahead of time. Given the strong frontogenesis and -EPV signal we know there will be strong banding and the potential for 3″ or 4″ per hour rates but where and how transient those bands are remains to be seen. Enjoy the storm! I’ll see you on Twitter and I’ll be on WNPR tomorrow around 7:10 a.m.